1. Mix flour, crisp oat flakes, sesame, sunflower seeds, pumpkin seeds, flaxseed, and 2 teaspoons of salt together in a bowl. 2. Add 0,375 l of cold water and the oil to the mixture. 3. Use a dough hook to knead all ingredients into a tough dough. 4. Take 2 baking trays and cover them with silicone baking sheets. 5. Spread the dough onto the baking sheets into two squares with 30x30 cm. 6. Cut the dough into ca. 15 pieces (each ca. 6x10 cm). 7. Back the crispbread in the oven at 225°C for 5 minutes. 8. Reduce the temperature to 175°C and bake for another 20 min. The crispbread is ready-baked and crisp if the outer rim is slightly browned. 10. After taking the crispbread out of the oven, remove it immediately from the baking sheets and let it cool down. 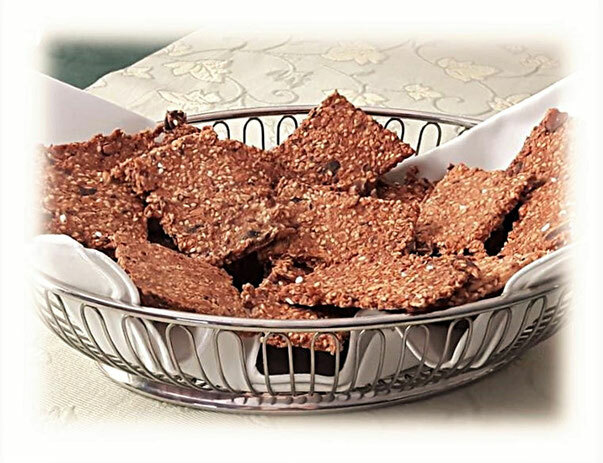 Tipp: You can eat the crispbread for breakfast with some cream cheese or on its own for a healthy snack in between. Ich habe gestern sofort das Knäckebrot ausprobiert. Ich kann nur sagen, ganz tolles Rezept und schmeckt hervorragend. Hi there would you mind letting me know which web host you're using? I've loaded your blog in 3 different web browsers and I must say this blog loads a lot quicker then most. Can you suggest a good web hosting provider at a reasonable price? Thank you, I appreciate it! Wow! In the end I got a webpage from where I can in fact take useful information concerning my study and knowledge. I have been exploring for a little for any high-quality articles or weblog posts on this sort of house . Exploring in Yahoo I at last stumbled upon this web site. Reading this information So i am happy to convey that I've a very good uncanny feeling I discovered just what I needed. I most undoubtedly will make certain to do not forget this site and give it a look regularly.